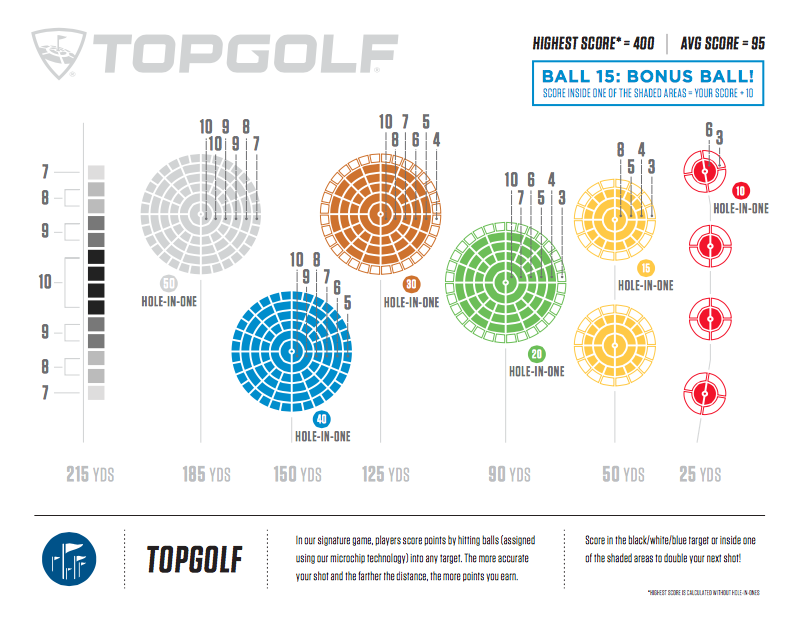 Top Golf has three levels of driving greens to play games like Top Shot and Top Drive. The goal is to get golf balls in the color-coded circles in the field, each one symbolizing a different yardage. The driving area is high-tech with a computer score tracker and a hands-free ball dispenser. All of the stations have a full set of clubs or you are welcome to bring your own. Bays are set for six players. Each bay has couches, tables and heaters for the winter months. Each bay also has full service for food and drink. The menu at Top Golf is diverse including a Brisket Mac n’ Cheese to a burger called the Mac Daddy with green chilies and Mac n’ Cheese on top. Another notable dish is the Chicken and Waffles Sliders; two house-made waffles with crispy tenders topped with maple syrup and jalapeño gravy. Top Golf is available for events like bachelor and bachelorette parties, birthdays and gender reveal where the food is taken to the next level. There is a dessert unlike any other at Top Golf: Injectable Donut Holes. These tiny donuts come in a bucket and have three flavors to inject in, Chocolate, raspberry and bavarian cream. The cocktail and beer menu is also amazing. It includes two golf bag drinks that are made for two and requires two id’s to purchase: the Citrus Cabana and the Pineapple Punch. There are also three different Margaritas including one with strawberry. The beer menu will include a few local beers as well as the usuals like Yuengling and Corona. The Top Golf experience ranges in price depending on the time of day. From open to 12 PM is $25 an hour, 12-5PM is $35 and 5 PM to close is $45. There are discounts for Heroes: Active and Veterans, police, fire and EMS personnel. There is a Platinum Membership that includes unlimited play during platinum hours and priority access to just to the top of the waitlist during normal hours. Top Golf is celebrating its Grand Opening this Friday, July 20th at 9 AM. For more information and to view pricing visit https://topgolf.com/us/pittsburgh/.